First, the good news: You can develop fast picking speed on guitar, if you have fully functioning limbs and a desire to succeed. More great news: you do not have to practice eight hours a day to develop this skill. However, improving your guitar technique very often requires you to work on refining some seemingly “simple” (fundamental) parts of your playing. For many this may seem like “bad news”, because practicing such basics doesn’t seem “fun” (no matter how effective it may be), and so those who ignore such advice often continue to struggle without knowing the reason why. If you have been practicing your picking technique for awhile but haven’t yet seen the results you were hoping for, then this article will help you with improving four very important areas of picking that most guitarists struggle with. This is not a complete list of possible challenging elements of guitar picking technique (I will address more of them in a future article), but you will improve your picking speed on guitar by following the advice from this article. I will describe below several very common problems that many guitarists have (and that I have had also in the past) with their picking speed. I will also show you how you can apply the advice I give in this article to your playing. If you want me to show you on video how to correctly practice and apply the ideas in this article to improve your guitar picking speed, watch a (totally free) guitar picking speed video lesson at my website that is available to my free newsletter subscribers. Otherwise, I will do my best to explain these technical points to you using text alone. All great guitar players prefer different picks in terms of size, shape and material (this is largely a matter of preference). However all of the fastest guitarists use very thick picks (at least 1mm thick, and in some cases 2 mm or more is used). Picks that are thinner than 1mm can be fine for strumming chords and other types of playing, but they won’t work for playing fast. They simply aren’t strong enough to handle very fast playing. Because the pick bends when you play a note, it takes an extra fraction of a second for it to come back to its natural point of “rest” and these accumulated delays (from each pick stroke) add up and make it impossible to play really fast. So if you are analyzing the type of pick you are using, remember that the most important dimension of your pick is its thickness, rather than its size, shape, tip, or the material it is made out of. Of course, these other things are also important, but they make a much smaller impact on your overall progress in building guitar picking speed than thickness does. Although there is clearly more than one correct way to angle the pick for playing on the guitar, when it comes to building speed, some ways are “more right” than others. If your pick isn’t angled correctly towards the headstock of the guitar, then you end up using much more picking motion than is necessary to play (which of course limits your maximum guitar speed). The angle of the pick to the strings determines how easy it will be for your pick to slice through the strings and how much extra movement will result from each pick stroke. Many guitarists hold the pick too close to perpendicular on the strings and make the playing more difficult for themselves than it needs to be. For maximum speed, the appropriate pick angle needs to be about 45 degrees towards the head of the guitar, but almost no angle at all up and down (in relation to the strings). Angling the pick too far up or down will make one type of pick stroke (upstroke or downstroke) easier to play and the other more difficult to play. This works fine for sweep picking or rhythm guitar playing, but for regular picking through scales, the angle needs to be more neutral (since both upstrokes and downstrokes occur with much greater frequency). Of course there are many variations for the ways you can angle the pick which work great for specific musical contexts, and of course there are some really fast players who hold the pick differently from what I wrote above (Shawn Lane being one very famous exception, among several others). However, the vast majority of the fastest players do follow the approach above, and if you are still struggling with your own picking technique, I recommend highly applying it to your playing, because it is one of the methods that has been proven to work for a lot of really great players. If you are not 100% clear on what I wrote above about angling your pick, watch this free guitar picking video lesson and my explanations there will help you to see clearly what proper picking angles should look like for fast picking. Many guitar players mistakenly think that they need to hold the pick very lightly in order to pick fast. The reality is that if you do this, your pick will likely fall out of your hand as you speed up. On the other extreme, if you attempt to grip it too tightly, your entire arm will become so tense that you will not be able to play well (or play fast). Rather than thinking about how much pressure to apply to the pick, find a position where the pick does not move at all in your hand, while at the same time you don’t have to apply a lot of pressure to hold it in place. One of the ways of doing this is to overlap your thumb over the pick as you are holding it. This will keep the pick very secure in your hand and won’t require a lot of pressure to hold it in place. Also, I have found that using a large pick helps with finding the ideal way to hold it without applying a lot of extra force to do so and I recommend trying this out yourself. This problem comes from the belief that you must play with “as little tension as possible all the time” in order to play fast. As a result, many guitarists develop the habit of picking everything with a very light touch and when they try to play faster, they are able to apply even less power to each note. This means that the faster you play, the less your playing is heard. Eventually you will reach a speed where your pick doesn’t even make contact with the string. Fortunately, the solution to this problem is rather simple. You need to begin putting greater focus in to this area of your playing even when you practice slowly, and you will see great results. Remember also that the goal isn’t just to “pick the strings harder”, but you also need to avoid accumulating tension in your picking hand as you play. This is possible to do by consciously relaxing before and after playing each note. If you want to learn more about this idea, watch this video about building guitar speed. It doesn’t matter if you like their style of playing or not (since the topic here is strictly about guitar picking technique). Listen to how strong their pick attack is, even when they play fast. If you can detect a noticeable difference between their articulation and yours, then you have identified a very important source of your frustrations with your picking speed. Think carefully about the points in this article and apply them to your playing. You will see great results when you do! If you are unclear about any part of what I explained above and want to see me do it on video, watch this free guitar picking video lesson on my website that I send to all my newsletter subscribers. Are you stuck in a rut with your guitar playing? Do you get tired of playing the same old sequences and licks using the same articulation? If you answered “yes,” then I am going to show you how to spice up your playing by combining two common techniques: regular picking and legato playing to achieve unique sounding guitar licks. Paul Gilbert is the first guitar player who comes to mind who uses this technique extensively. Some of his most terrifying licks are based on combining picking with hammer ons and pull offs. I am going to explain to you the basics behind this technique and then show you how to build up to playing cooler-sounding, more advanced runs and arpeggios. The most fundamental patterns that we are going to build from will be Examples 1 and 2 below. If you want to see videos of me playing each of these examples (fast and slow), visit my site and watch them in the free shred guitar lessons section available to my free newsletter subscribers. Make sure that your accents are totally accurate and precise (as I play in the video and as shown in the tab above). The most important thing is the picking/articulation used here. It is NOT all legato, nor is every note picked. The key is combining the two techniques in a seamless way that produces a very “snappy” sound of the accents when they are emphasized with the pick in the midst of the legato notes rushing by. To step things up, here is a new lick that builds from the previous 2 patterns. If you are familiar with Paul Gilbert’s playing, you will probably recognize the sound of one of his classic licks. Again, pay very close attention to the picking markings indicated, so that you know which notes to pick and which ones to play legato. You need to keep your fretting hand very relaxed while you play it, and at the same time focus on making the pull offs loud and forceful (more about this in a moment). Make sure that your accents are precise to achieve the right sound (watch the guitar shred video on my site to hear it played correctly slowly and fast). Also, practice a longer lick like this one by breaking it into manageable sections before putting it together. It may look very difficult, but if you practice it only a few notes at a time, you will get through it without too much trouble. 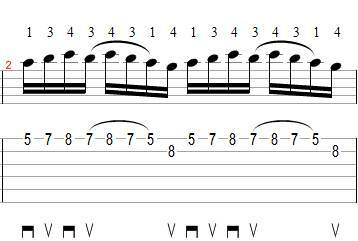 This particular method of playing arpeggios was also made popular by the great Paul Gilbert. Rather than using sweep picking, he used string skipping to achieve a more precise and rhythmic effect. The technique is quite challenging at first, so make sure to practice the regular scalar fragments shown above. I will show you one of my favorite licks to play that will be used in one of my songs in my upcoming album. It shows some more musical applications to this cool technique. If you want to watch a free video lesson that goes into detail about this challenging arpeggio lick, it is available here. Your hammer ons and pull offs need to be loud. 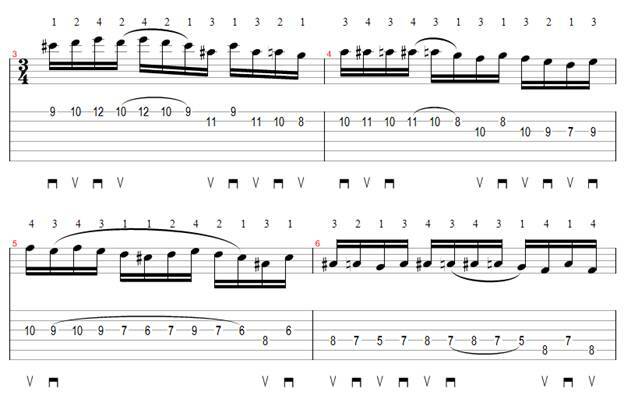 As I wrote in my article on how to sweep pick, try to make them as loud as your picked notes. 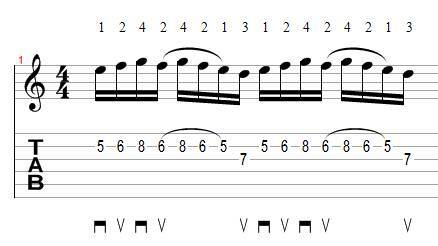 It is very important to practice these licks both with distortion and without. This is important as practicing with distortion helps with increasing your dynamics, and practicing with distortion helps with controlling sloppy noise. It is very effective to end the licks on a pinch harmonic (watch the video examples to see this). Practicing this technique will help to open up a new range of sounds for your guitar playing. Be sure to begin applying these ideas to your soloing and improvising right away and you will greatly expand your creative possibilities. Mike Philippov is a professional virtuoso guitarist, music composer and instructor. He is also a co-author of several instructional products, numerous articles and other free instructional resources available on MikePhilippov.com. To effectively mute guitar strings we do not want to be heard, we need to use two totally different sets of muting techniques: One to stop unwanted noise from LOWER (in pitch) strings; and another to mute the higher (in pitch) strings. Although there is more than one way to mute guitar strings, some methods offer advantages that others do not and are therefore (in my opinion at least) better. The flesh of your palm is much softer than the side of your thumb and therefore takes more time for your palm to actually stop the string from sounding. It is not easy to get your palm in the perfect position to consistently and reliably mute strings that are adjacent to the one you are playing in all playing situations. About the author:Tom Hess is a professional guitarist and teaches electric guitar lessons online. ©2009 Tom Hess Music Corporation. If you are like most guitarists, you probably, at one point or another have found it difficult to improvise solos on guitar. Even if you possess a high level of technique and good knowledge of music, sometimes your advanced skills (ironically) can be a detriment to self expression if used inappropriately or at the wrong moment. In a way, sometimes it is possible to restrict your own creativity by being “too advanced”. When you have many techniques, areas of knowledge and skills to choose from and are forced to make soloing decisions quickly, you may often end up making bad musical choices which distort your creativity. Fortunately, there are solutions to solving this problem. I want to offer you several suggestions on how to make the most out of any soloing situation you may find yourself in and give you general ideas which you can apply right away. If you want to see and hear how all of the concepts (that I am about to describe) were put into practice, you can watch a free improvising video of me playing using the concepts I will discuss below. It is available, by the way, to my free newsletter subscribes. You probably know that it is important to think of “melody first” when starting to solo, but I am going to tell you a bit more about how you can use melodic tools to establish a “basic framework structure” in your solos that will enable you to add faster parts later without taking away from self-expression. 1. Start simple. Don’t be tempted to shred too much in the beginning of your solo! This may seem like an obvious point to some, but I want to make sure we are on the same page. Think of melody first and treat your slower melodic lines as a “skeleton” and think of any faster fills as “fleshing out” the skeleton. It may be tempting to play fast too soon (especially if you are able to play fast), but when you begin any new solo it is much better to think of melody first. Don’t get me wrong, I love to play fast and shred in my solos, but I always make sure that there is a melody in them first, before thinking about adding faster parts. In the video I mentioned a moment ago, I do play a fast lick leading into the main solo, but the majority of the solo is very melodic and slow on purpose. Even if you choose to play faster licks, they need to “lead into something” and serve a musical purpose. 2. Practice “saying more” with only one note. When I was taking improvisation guitar lessons with my awesome guitar teacher Tom Hess, one of the things he had me practice was playing only one note, using only bends and vibrato as my phrasing tools. This one technique has done an incredible amount not only for my vibrato, but for my overall creativity and expression. In fact, sometimes I even use this technique in actual soloing situations when it is appropriate to create actual phrases with only one note (more on this later, in “Point 4”). 3. To get the most dramatic effect possible from your solos, try to create a harmonic background that has a lot of extended chords (seventh chords, add note chords etc…). For example, in the solo that I improvise in the video, I play over one of my most favorite progressions, iadd9 – VI7 – iv7 – ii half diminished add 11- V7 add 13. Because the chords in this progression are “add note” chords or seventh chords, soloing over them lends itself very nicely to melodic playing. 4. Take advantage of common tones. This is one of my favorite things to do when soloing melodically over chords that have a lot of notes in them (such as the progression used above). For example, the chords listed above offer several possibilities for common tones. Even if you did nothing else except hold one note (that is common to all chords) with heavy vibrato or bending a short distance away from that note while the chords change, you will still get a very cool sound. In the progression above, the note “C” is a chord tone in all but one of the chords, and you can take advantage of this when soloing to create passing tones, suspensions and other effects. 5. Repeat phrasing ideas in different octaves. It is a very cool thing to do that will help you get more expression out of shorter phrases, particularly if you make subtle variations in the phrasing using vibrato and other things. After you have an identifiable melody in place, using these ideas listed above as well as others, it is relatively easy to add more advanced things from that point such as, targeting melodic notes with a faster scale sequence, using arpeggios etc… The good news is that if you approach soloing in such a way, your “shredding” will become very appropriate and will add to your self-expression rather than take away from it. In the guitar solo video that I mention throughout this article, I tried to incorporate all of the five main points discussed here to show you how a basic melody can be developed. This outline, of course, is not the only method of creating solos (there are many more), but it is one of my favorites. I encourage you to give it a try and have fun with it! Do you want to improve your guitar technique, play guitar cleaner, eliminate sloppy playing and unwanted string noise? Sloppy guitar technique is a very common problem. Many guitarists have been asking for solutions. This article will help you to improve your guitar technique. Today we will take a look at the first two groups. In Part 2 of this article series we’ll focus on the last group of guitar technique challenges. Focused Awareness – Many guitar players are not fully aware of every imperfection in their guitar technique. Some of these players do sense that ‘something’ may be wrong, but are not sure about exactly what their specific guitar technique problems are. Obviously, you cannot effectively correct a technical problem until and unless you know exactly what it is. Work with a guitar teacher to evaluate your playing and use that feedback to begin the process of making any necessary changes to your technique. Not only will a good teacher help you to play clean by telling you ‘what to do’, but also because he will hear problems that you may not really be hearing. IF you have an excellent ear, you should be able to identify the fine details of your problem, if not, work with your guitar teacher. The second step is to focus on your articulation. Articulation is the first half of two hand synchronization. To play cleaner you need your hands to fret and pick each note at precisely the same time (simultaneously). Use a clean guitar tone when practicing (no distortion and NO effects!). Distortion and effects will mask any imperfections in your articulation, so do not practice with them when focusing on “Articulation” (the rules will change when we talk about “The Release” in the next section). Play loud enough so that you can truly hear what is happening as you are playing. When you are practicing something slowly MAKE SURE that you do NOT change ANYTHING about how you approach and articulate each note. Fact is, most guitar players actually play very differently when playing slow compared to when playing fast. If you change anything in the way you are articulating the notes (such as playing with a lighter touch, using a weaker or stronger pick attack, changing your hand position, pick angle etc.) you will NOT fully improve your technique because the sound you make when playing will be different and therefore harder to detect and identify any problems with your articulation. The third step toward cleaner playing is ‘the release’. For most guitar players ‘the release’ is the hardest problem to detect and correct. That’s generally because once players articulate a note cleanly, they ignore what immediately comes after (small sloppy noise in between the notes or two notes slightly ‘bleeding’ together. And practicing your guitar with a ‘clean’ tone (no distortion) – as described above when focusing on articulation – almost always masks problems in the release phase of playing a note. This is why many people think their guitar playing sounds pretty clean when practicing without distortion but sense something is wrong when later playing with distortion… but they are not sure what the problem is… or worse, they actually do not hear the problem at all (but other people do). This is why focused awareness is so critical. I use multiple steps to help my guitar students fully solve this problem (not all of which can be fully demonstrated or expressed in an article), but here are the absolutely necessary steps toward correcting problems with ‘the release’. Practice your guitar WITH distortion (but NO EFFECTS!) now. (Notice, this is the exact opposite advice I gave you to identify and correct ‘articulation’ problems above). Again you need to play your guitar loud enough to hear precisely what is coming out of your amplifier (other noises in the room can mask the subtle things you need to be listening for). Practice slow (but as stated above, do NOT change ANYTHING in the way you articulate OR RELEASE a note compared to when you are playing fast!). Fact is there can be several reasons why your guitar playing may not be clean during the release of a note, but the most common cause is this: When you release a note your brain is probably telling your finger to ‘lift off’ (make an upward motion away from the string you just played). This can cause all sorts of nasty technique problems (fatigue, slower guitar playing speeds, and sloppy guitar playing… among other things). Because the motion is effortless, you can play faster and for a much longer time (and most importantly) with greater ease. Because your brain does not give the finger the instruction to make a ‘lift off’ motion this actually prevents your finger from moving (or preparing to move) prematurely (which is a major cause of the sloppy ‘scratchy sound’ that may be present in your guitar playing. It is now very important to realize two things. First you CAN solve these problems and improve your guitar technique. Second, it won’t happen over night, this will take time and some consistent practice (possibly over several weeks or longer). But the benefits of being able to play guitar clean are well worth the patience required. To get more help with your guitar playing check out my 15 Free Guitar Tips. In Part 2 of this article series we’ll focus on the last group of guitar technique challenges. If you began to read this article, chances are that you have been working on your sweep picking technique and struggled with improving it. If this sounds like you, then I want to show you how to avoid the 4 most common technical pitfalls that many guitarists fall into when trying to improve their sweep picking. These four problem areas typically do not occur in isolation. Typically if you have one of the four problems described below, you have the others to some degree also. The good news though is that once you work on fixing at least one of these problems, the others tend to improve as well (it works both ways). As you read on, you will understand why. 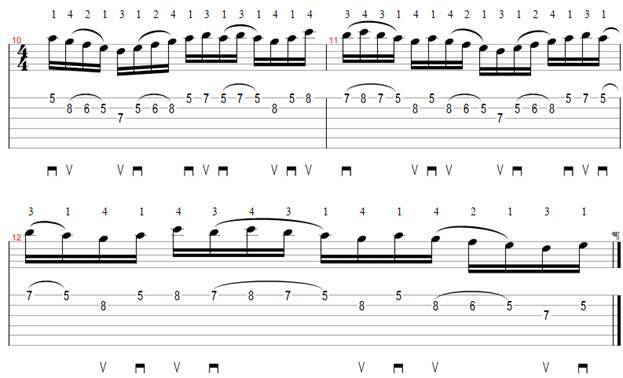 If you want me to show you on video how to correctly practice the following ideas in this article, you can watch a (totally free) 20 minute sweep picking video lesson at my website that is available to my free newsletter subscribers. Otherwise, I will do my best to explain these technical points to you using text alone. Many players struggle with separating the notes of arpeggios, because they do not release the fingers from the notes that have already played, which results in all of the notes of the arpeggio ringing together. Although this follows the theory of “minimum motion” for the fingers, it breaks the most important rule of clean sweep picking: each note must have definition and clarity! So on one hand, it is tempting to want to minimize the motion of the fretting hand fingers as much as possible, and on the other hand, you also need to make sure that the notes are sounding cleanly. The solution is to find the balance between releasing the fingers from each note right after you have played it, but doing so without letting the fingers come up “too far” away from the strings. Obviously if your fingers move too far away from the strings, it makes it difficult to bring them back down to play when needed. That being said, you need to lift the finger off the string slightly after it has played (so that it stops ringing), and also mute that same string with your picking hand (more about this later). Remember that economy of motion is a “relative” concept and not an “absolute” concept. So even though releasing the fingers from the notes they have played is not an “absolute” application economy of motion, it is necessary to do this in order to play the technique cleanly. This advice may seem like perfect common sense when you read about it, but MANY guitarists have a difficult time with finding the right balance between the economy of motion and playing cleanly (in this part of guitar playing technique especially, but also with other techniques). One of the biggest sources of confusion of the rolling technique is that it is often confused with “barring”. When you play barre chords, you fret notes of two or more strings at the same fret with the same finger and you let all the notes ring together. When you perform the rolling technique, you have to actually physically “roll” the finger across strings by bending it backwards. As a result, the notes sound separated. This technique is best shown on video or in person, but basically you play the first note of the roll with the tip of the finger, and then bend it backwards fretting the remaining notes of the roll with the soft fingerprint. You then reverse the motion when you descend. Your first knuckle of the finger becomes the pivot point that bends or collapses allowing you the flexibility of fretting the notes cleanly. 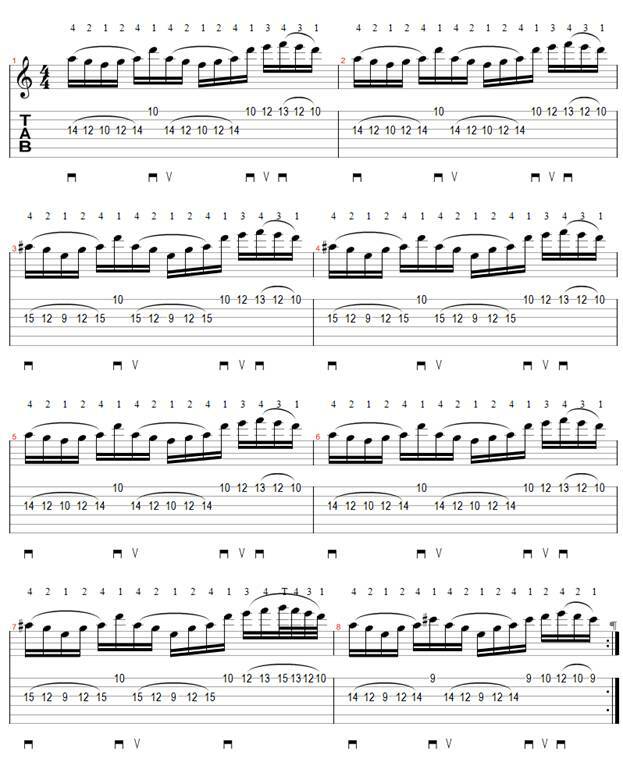 If you are unsure about how to specifically practice this motion, I can show you precisely what the finger rolling motion should look like in the free sweep picking video at my site. The good news about the rolling technique is that although it is hard in the beginning, it is actually one of the absolute easiest things to do on guitar once you get better at it. But in order to make sure that you do master it in minimum time, make sure to follow the guidelines above. Many players neglect isolating and practicing this part of the arpeggio in the shapes that require a pull off on the top string. As a result, the weak pull off distorts the rhythm of the notes and the arpeggio doesn’t sound clean. The picked notes usually sound rushed, and come out much louder than the pull off (which is barely audible). The solution is to practice just the pull off part of the arpeggio with the amp off. You should be able to hear the pull off very clearly even with the amp turned off. If you apply more force to make the pull off loud when you practice with no distortion, then after you turn distortion on, it really becomes a lot easier to play the entire arpeggio smoothly and cleanly. Try to match the volume of your pull offs as closely as possible to that of your picked notes. This will not be entirely possible, but by constantly striving for it you will make great improvements in your legato playing in general and in this area of sweep picking specifically. Conventional wisdom suggests to practice sweep picking with a clean guitar tone in order to make it easier to hear imperfections in your technique. This is true on some level, BUT practicing only with a clean tone makes it hard to hear excess string noise that can occur either from letting the notes ring together (problem 1 described above) or from not muting the strings that are not supposed to be playing. In reality, it is even more important to practice with distortion because only then will you become aware of any excess noise that may be present and correct it. If you have limited time to practice, then definitely you should practice with distortion only. This one practicing tip (which I learned from my guitar teacher, friend and mentor Tom Hess) helped me to greatly improve my own sweep picking in a short amount of time. When you do become aware of the sloppy extra noise, it becomes much easier to fix it and mute it (using a variety of techniques in your picking and fretting hands). If you are unclear about any part of what I explained above and want to see me do it on video, visit my website and I will show you the free sweep picking lesson on video that I send to all my newsletter subscribers. You can also contact me by e-mail at mike@mikephilippov.com with any questions.